The 53 stations in the Greater Dublin Area have now been upgraded to cater for Leap Cards, eight months after the system was first brought in. "To the nearest DART station, lads"
GOOD NEWS FOR Dublin commuters: Leap Cards, the integrated ticket for city’s transport system, can now be bought and topped up at DART stations around the city. The Leap Card system had been repeatedly criticised for not allowing travellers to top up their cards at DART and Commuter stations within the city zone when the card was introduced in December. The 53 stations in the Short Hop Zone which covers all of Dublin and some suburbs in Meath and Kildare have been upgraded by Iarnród Éireann and the National Transport Authority to cater for Leap Cards. Existing DART users who use a Smart Card can exchange their old card for a free Leap Card at the Leap Card website. 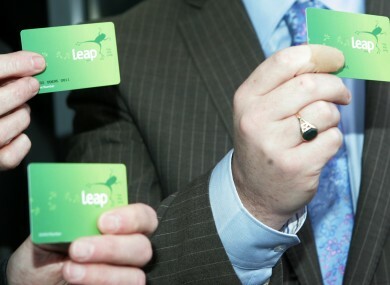 Email “Good news, Dublin commuters: Leap cards can now be topped up at DART stations”. Feedback on “Good news, Dublin commuters: Leap cards can now be topped up at DART stations”.